A woman emerges from a shell on the beach. Caught up in the bliss of becoming, she spreads her arms like wings and flies. The shell is the legendary chambered nautilus. What does the nautilus mean to her? Everything. Its life is a metaphor for her soul journey. The life of the chambered nautilus demonstrates the transformation of which Dr. Dyer speaks. Born as a tiny, single-chambered shell, it steadily expands by adding new, internal chambers to the first in a perfect, concentric spiral. As each fresh cell is completed, the nautilus moves in, seals off the last compartment, and creates an identical, larger dwelling space. Over a 20-year lifespan, it can reach an impressive size. It travels the ocean by jet propulsion. Squirting water from a funnel at the mouth of its shell, it propels itself backwards, seeking new horizons to support expanding needs. It takes advantage of currents to assist its journey, yet swims against the tide if necessary. When not traveling, it lives on the slopes of coral reefs at depths of around 800 feet, beyond the reach of men. It ascends to shallower waters at night to feed. Adjusting the buoyancy of its inner chambers, it rises and sinks – a process adopted by divers and modern submarines. It’s a survivor! The nautilus propelled itself through ancient seas over 500 million years ago, before dinosaurs roamed the Earth. Yet it continues to adapt to modern conditions. Its ranks are successfully evolving and expanding from the Indian Ocean to the tropics of the Pacific. Do you want growth and expansion in your life? Remember the nautilus. Build your life one cell at a time. Remain open to life’s currents and opportunities. Adapt to them, while remaining true to your deepest instincts and intentions. Don’t be afraid to buck the tide. Cast off doubt, and journey fearlessly into an uncertain but promising future. Trust in yourself, and in an ever-expanding Universe, is the beginning of growth. 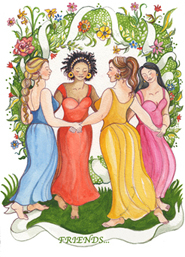 Click here to choose a FREE eGoddess card to send to a friend! Simply choose your card, then click “Join now” to sign-up for your free membership and get sending! 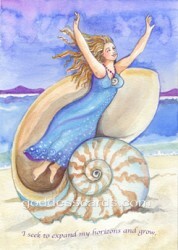 Or learn more about Anne and why she started her inspirational Goddess Cards here. Click here to send this gorgeous eGoddess card free to a friend! Simply click “Join now” to sign-up for your free membership and get sending! the work of maintaining electrical equipments and switch boards on the spot. small business and essential services with small scale new energy generators. These are some great principles to keep in mind. Especially like the one about grtowh only happening when you’re moving forward.I was interested in your Duh to the idea that your personal issues come up when you start a business. This is the foundational idea behind my work, but I repeatedly hear from clients that they had no idea how starting a business would dredge up all this stuff. It’s obvious once you’re in it, but usually people don’t realize it going in. Then when they do realize it, it takes a strong conscious decision to go forward knowing you have all that inner work to do. Well worth it, though! Goood day! Do you know if they make any pluins to heop with SEO? I’m ttrying to get mmy blog to rank for sime taargeted keywordss but I’m not seeing very good results. If you know oof any please share. Thanks! Consider frying in peanut oil, canola oil or other oils that are low in the bad fat.